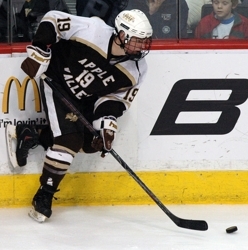 If all goes as planned, Apple Valley junior A.J. Michaelson will be driving home from Bemidji sometime during the weekend of Oct. 16-17, passing the time by weighing all the variables in what will be, to date, the biggest decision of his life. Still, as one of the state’s most recruited hockey players, Michaelson is in the thick of the process of choosing where he will attend college. Most major programs are offering scholarships. He’s visited the University of Minnesota, the University of North Dakota, the University of Minnesota-Duluth and Wisconsin. “I’ve narrowed it down to Minnesota and North Dakota,” Michaelson said on Sept. 25 during a break between Upper Midwest High School Elite Hockey League games. The 6-foot, 182-pound Michaelson scored 19 goals and added 16 assists for the Eagles last season and, in the spring, was ranked No. 1 on the Hockey Hub’s list of the state’s top sophomores. This summer he turned down an offer to attend USA Hockey’s National Development Team Program in Ann Arbor, Mich., was drafted by the Waterloo Blackhawks of the United States Hockey League and also selected by the Portland Winter Hawks in the Western Hockey League’s draft. Oh, and there was the August trip to Switzerland where, as a member of Team USA, he won a gold medal in the Under-17 Five Nations Tournament. Now, when he’s not playing for Team Southeast in the Elite League (he had five goals and four assists through nine games) he’s pondering where he will attend college. While he says the Gophers and Fighting Sioux are in his final two, Bemidji State, with its new 4,000-seat, $35-million arena about to open, also gets a look. Michaelson said there are several factors he’s considering as he makes his decision. Michaelson figures he’ll have all the information he needs after that road trip to Bemidji.